And so, that’s what I’ve been doing. We welcomed baby number three, a beautiful and healthy baby boy, in August 2018. We’ve been adjusting well to raising three children, all three years old and under, while running a successful food blog. I have no immediate plans to continue blogging here at My Pennywise Life, but I’m thankful for the experience I gained here, and plan to leave the content in place. To see what I’m up to currently, head on over the The Foodie Eats. 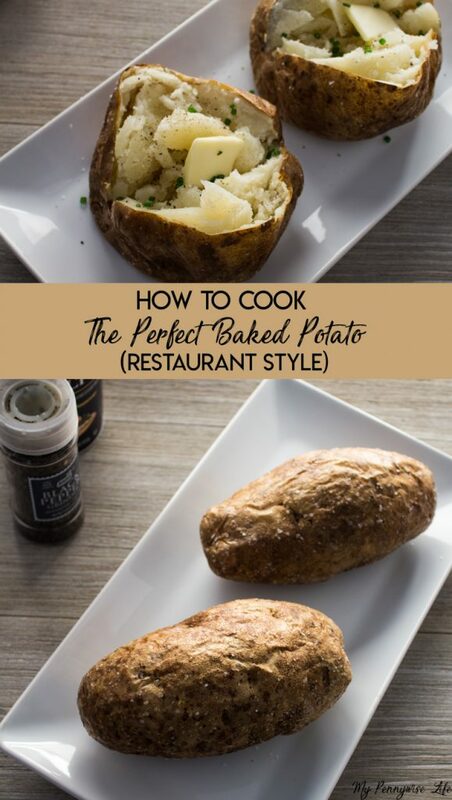 How to Cook the Perfect Baked Potato (Restaurant Style): Ever wonder how restaurants get perfectly fluffy baked potatoes? Today I’m sharing the secret! 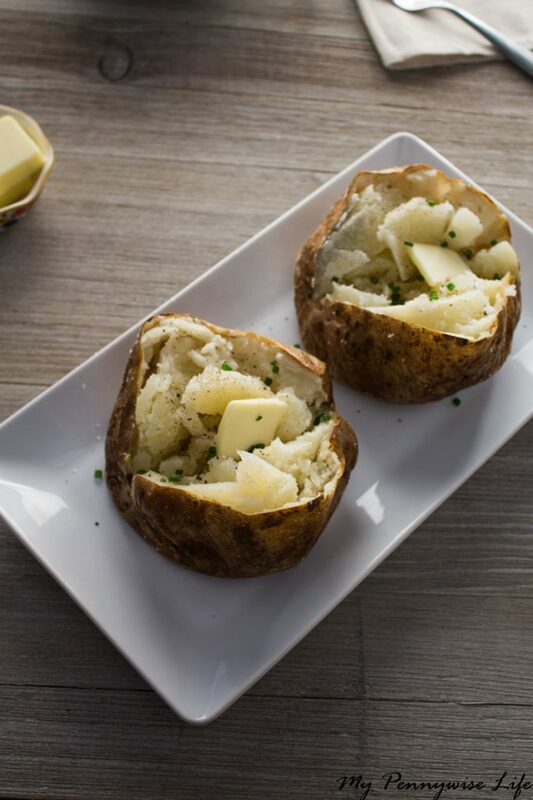 I was enjoying an incredibly fluffy baked potato at Red Lobster one evening, wondering why my home-cooked baked potatoes were never quite as good. My husband Gary somehow managed to cook perfectly fluffy baked potatoes every time, and I wondered aloud what I was doing wrong. Though Gary had told me how to cook the perfect baked potato before, I still couldn’t quite pull it off. So, he told me again, and this time it clicked. I realized what I’d been doing wrong all these years. Oil and salt. That’s it, that’s the secret! But, you have to know how to use it. When Gary first told me the secret of how to cook perfectly fluffy baked potatoes, mine still didn’t turn out quite right. Turns out, I wasn’t being generous enough with the salt. When prepping your baked potatoes, first, rub oil over the surface of the potato (I use grapeseed or olive oil), then coat heavily with salt. You want the potato to be crusted with salt. I made the mistake of just sprinkling it all around thinking that was enough. Get as much salt on there as possible! It will help draw out the moisture during the cooking process, leaving you with the fluffiest potato possible. 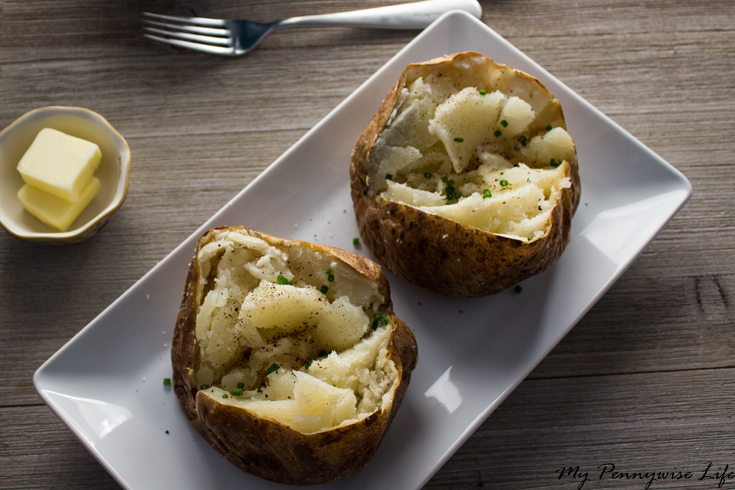 Cook perfectly fluffy, restaurant style baked potatoes in two easy steps! Coat generously with kosher salt. The entire potato should be coated with as much salt as possible. Bake at 400 degrees for one hour. To fluff up your potato even more, press on each end with the palm of your hands, squeezing gently toward the center, before serving. Often lumped together with nutrient poor white pasta and breads, white potatoes have gotten a bad rap. Sure, if you’re following a low-carb diet, potatoes may not be for you, but potatoes have numerous health benefits. “The humble potato is vastly underrated in regards to its nutritional benefits. 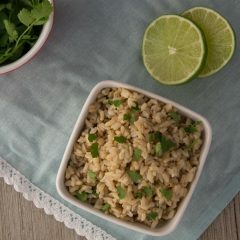 Due to the increased interest in foods that are low-carb or low-glycemic index, the potato has unjustly earned a bad reputation because of its starchy makeup, leading many to believe that it should be cut out of the diet altogether. 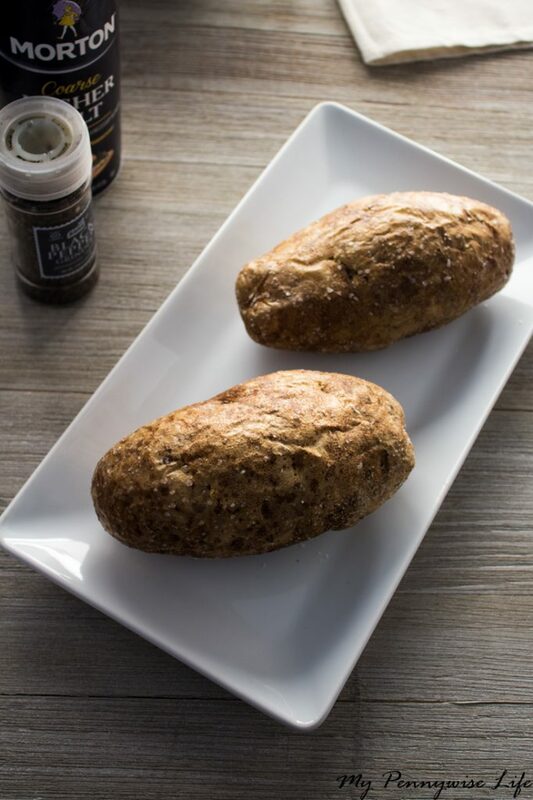 However, this nutrient-dense tuber is, in fact, packed with a variety of vitamins, minerals, and phytochemicals that ward off disease and benefit human health.” Click here for the full article. 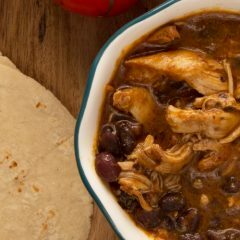 Do you have any tips for cooking restaurant style foods at home? 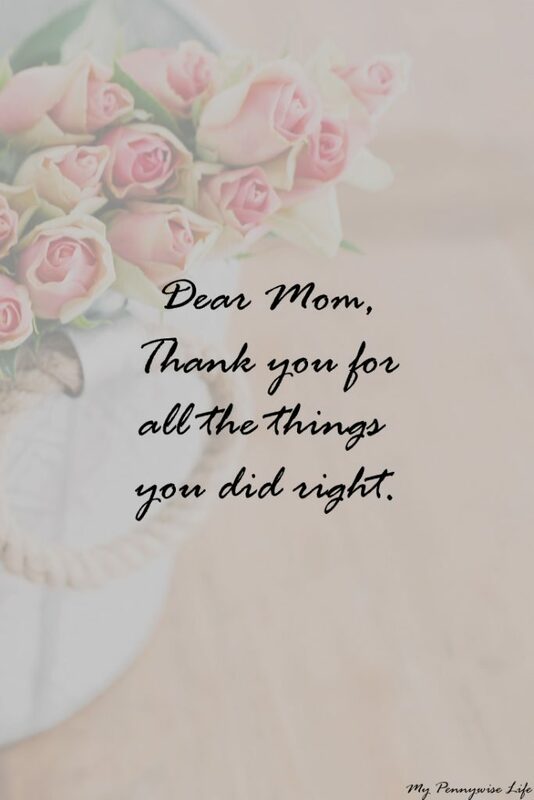 As a mother it’s far too easy to focus on all the things we didn’t do, or the things we wish we’d done differently, instead of the things we did right. Today, I want to celebrate all the things my mom did right. But, since that list could go on and on, I narrowed it down to five things that I’m so thankful my mom did for me. Thank you for all the things you did right. You instilled a love of reading. You read to us every night. I still remember some of my favorite picture books, and how much I loved hearing them read aloud night after night. You also showed me how much fun reading could be. I remember you sitting in an armchair, reading novels, almost every night. Instead of dreading reading as a chore, I learned that reading is enjoyable long before I began to read because of your example. I remember a night when we all camped out in the hallway on the old futon. I was only eight, and all I knew was that it was stormy outside. I had no idea the Storm of the Century was rolling through. You assured us it was alright, that we were safe, and somehow made it fun to be camped out in the dark listening to the weather radio. Throughout my childhood, you kept me from unnecessary worry. You made me feel secure. I know, this one is similar to the last one, but this one isn’t about physical safety. When I was a kid, I always felt provided for and taken care of. I never felt as if we didn’t have enough. I had no idea that for a while money was tight, and that you had to meticulously put together a grocery list each week to make sure we had food on the table without going even a penny over a very limited budget. I don’t remember ever hearing you talk about not having enough, the stress of having to count every penny, or worry about how you would manage if an unexpected expense came up. While you may have worried about how we would make it month to month, you sheltered me from that burden. You taught me to be safe without being overprotective. Just because someone knew my name, or yours, didn’t mean they really knew me. If a family friend or someone claiming to know you came to pick me up in the event of an emergency, we had a code word they had to give to prove they had been sent by you. I’m thankful you took the time to teach me those things, without terrifying me of the world around me. You made sure I knew I was loved. This one is the hardest to put into words, but it’s also the biggest one. Beyond just telling me you loved me, which you did often, you showed me you loved me in a million ways. Your love for me was a given, I never doubted it or second guessed it. I wish I could say that’s just something all mom’s do, and that every child innately knows their mother loves them. Unfortunately, it’s not. I’m so thankful for the love you showed me every single day. I could go on and on with all the things you did right. I know you aren’t perfect, no one is, but you taught me how to be a mom by your example. When I look at my girls, I’m so thankful that I know how to love them because you first showed me how. 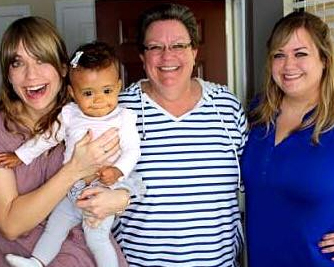 Me, G, Mom and my sister Katie in 2016. What things would you like to thank your mother for? Last week it began: Our second attempt at potty training our 24 month old daughter. The first attempt, at 22 months, ended after five long hours when I realized neither of us were quite ready. This time, I was determined to give potty training a full three days. 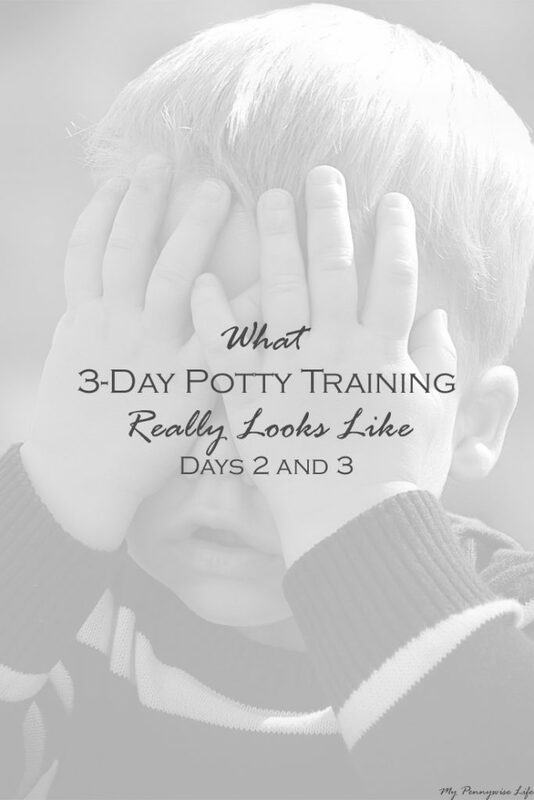 I’d already read up on our chosen method, 3-Day Potty Training, in posts like How the 3-Day Potty Training Method Works and Potty Training in 3 Days or Less. Once we began and things got real I realized I still had lots of questions. What did other parents do when they hit setbacks? If we went with the bare bottom for 3-days approach, what happened once day three was over and the pants were back on? Would we ever be able to go out in public again without a potty disaster? 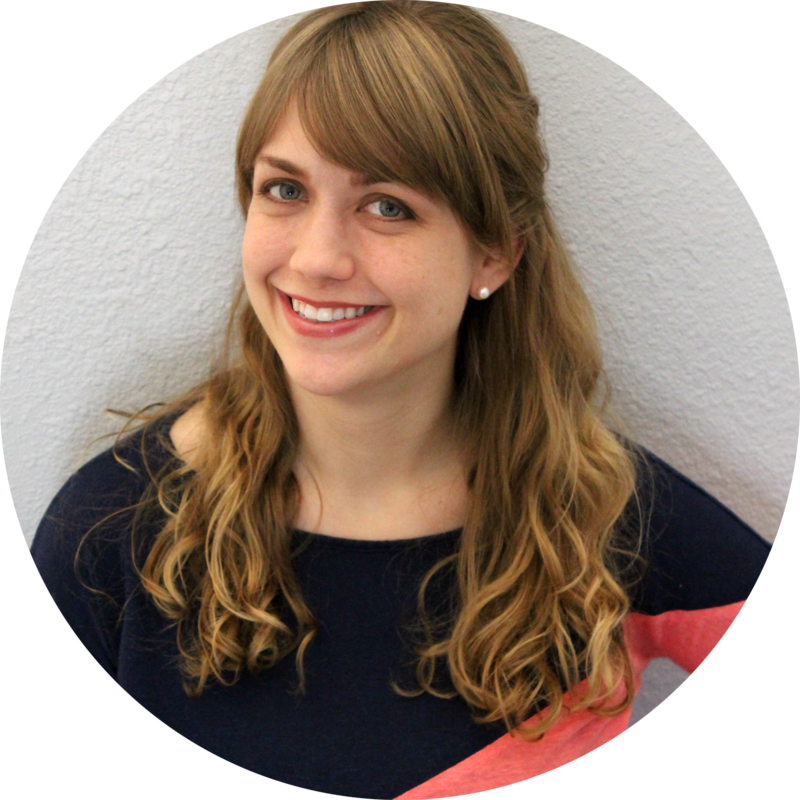 When seeking answers to my lingering questions, I came across two real-life examples of parents walking through the potty training process with their toddler. I found their posts so helpful that they inspired me to share our experience with potty training too. If you’re a parent who’s curious about what the 3-day approach looks like in real life, read on! This post gives a detailed account of day 1. See days 2 and 3 here. G was 24 months old, just 2 weeks past her second birthday, when we started. We chose to do the bare bottom approach instead of having G pick out special underwear. During our first attempt at potty training, two months earlier, she’d mistaken the underwear for a diaper. So, this time, I decided not to go there. We did not tackle nap time or night time potty training. My goal was daytime training. Once she consistently stays dry for naps, we’ll tackle those and then nights. Right now, she gets a pull-up for both. Just a few hours into day 1, we began using chocolate chips as a reward. I usually don’t use food as a reward, and I’ll admit, I was concerned we’d be doling out chocolate for weeks. However, by day two, the chocolate chips were no longer needed! We kept G supplied with watered down juice to encourage her to pee. She usually only gets a cup of watered down juice once a day, so this was a treat for her. I didn’t buy any potty training books or programs. 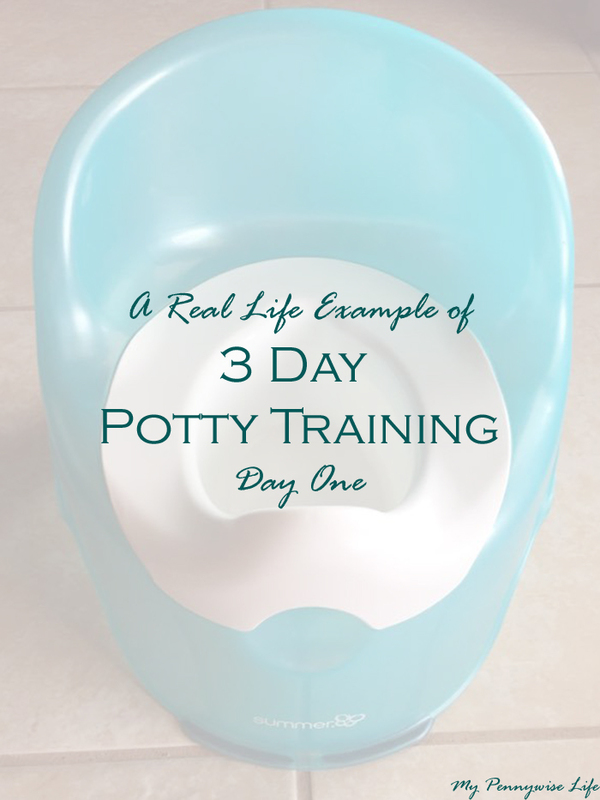 Our attempt is based completely on information found for free online, so our form of 3-day Potty Training may vary from those who are following a specific program or book. 7:30 Wake up time. We say goodbye to diapers and get G dressed in a long shirt. I show her the potty chair, which she’s familiar with. We bring it with us to the kitchen for breakfast, and then to the living room for play time. 8:30 One hour in. Still no poop or pee, despite sitting on the big potty three times, and the potty chair at least ten times. We watch the episode of Daniel Tiger about going potty (Season 2, Episode 1) while playing in the living room. 8:55 G starts to pee, but after a few drops on the floor and a quick reminder, she dashes to her potty chair and finishes in the potty! High-fives and cheers all around. 9:05 A bigger puddle on the floor. This time I whisk G to the potty chair. She puts up a small protest, but finishes in the potty. More high fives (and hand washing). 9:20 Another small accident, but this time G will not finish going on the potty and puts up more of a protest about being placed on it. The long shirt is now wet, so short shirt it is! 9:25 Bigger puddle on the floor, followed by a bigger protest and refusal to finish on potty. 9:39 More pee on the floor, tears and protest continue. 9:53 After five minutes on the potty with no success, we ended up with another accident on the floor and refusal to sit on the potty. 10:00 Decorating the potty with stickers results in trying to peel every sticker back off. Right now G is on the floor trying to refuse being put on the potty (including arching her back as I attempt to put her on it). I am starting to wonder what we’ve gotten ourselves into. 10:03 Another small tantrum over attempts to get her to use both the small and big potty. 10:15 Finally! She sits on her potty chair playing Daniel Tiger while I sit on the lid of the grown up potty across from her and she pees in the potty! We cheer and reward her with a chocolate chip. Yes, it has come to this. 10:25 Success! More pee in the potty. Cheers, hand washing, and a chocolate chip follow, along with more play on the Daniel Tiger App. 10:45 G asks for a chocolate chip when in the bathroom. I tell her not until she uses the potty. One minute later, she uses the potty. (Walking the line between rewarding and bribery now.) Lots of cheers and another chocolate chip. 11:10 G sits on the potty playing Daniel Tiger for 15 minutes to no avail. 11:30 G gets up in the middle of lunch to pee in the potty chair nearby without a reminder! 12:15 While playing on the couch, G stops, get down, and goes pee in her potty chair! 2:25 After waking up from her nap with a wet pull-up, G eats a snack, says hi to baby H, then runs to the potty to go pee. 3:30 After being asked for the 100th time if she needed to pee, G uses the potty on her own. 4:00 G gets distracted and has a small accident on the floor. She is able to stop herself and finish on the potty. 5:00 Successfully used the potty after a reminder. 5:45 G is unusually cranky and seems very tired, even after a long nap this afternoon. We start getting ready for bed. 6:05 G is in bed, with a pull-up on, an hour and a half earlier than usual. She seems happy to be relaxing in bed. I ended the day realizing there was no going back. G had shown that she was ready to use the potty. 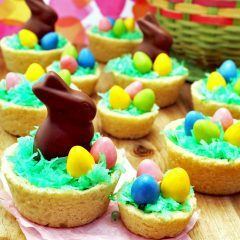 I was excited about the success we had, though a bit concerned that we’d be doling out chocolate chips for weeks to come. I also slipped up and bribed, instead of rewarding, G to use the potty around 5:00 by reminding her she would get a chocolate chip if she did. This made me determined to try to cut out the chocolate chips as soon as possible. Overall, I ended the day tired, but excited for day two! In addition to these, we had two step stools (one for each bathroom). The microfiber cloths were great for cleaning up accidents, and we already had them on hand to use with our Swiffer. G preferred the potty chair to the “grown up” potty, but we purchased potty seats to try to encourage her to use both.